Hagerty Jet Group, which specializes in preowned Gulfstream sales, deemed 2017 a success for the aircraft brokerage industry, noting an uptick in sales transactions, a decline in preowned inventory, and stabilizing prices. The broker also hailed that both Vref and Blue Book published values that were “mostly flat” for Gulfstreams in the fourth quarter. 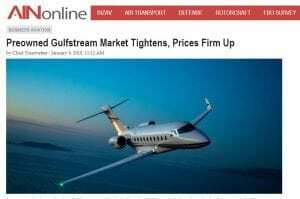 The company has seen a “shift in the market.” It said preowned Gulfstream buyers entering the market have been “frustrated” due to fewer choices and firming prices. In fact, Hagerty Jet said that three in-production Gulfstream models—the G650, G550, and G280—have very low inventory levels, with less than 4 percent of each fleet currently for sale. While depreciation has slowed down for most Gulfstream models, supply remains high in older models—including the G200, GIV-SP, and GV—with inventory between 10 percent and 12 percent, “which is more in line with the current industry average,” Hagerty Jet said.